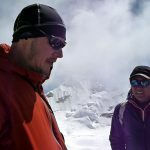 While in the planning stage of our Kangchenjunga trek earlier this year I consulted Nepal trekking and climbing guru Jamie McGuinness of Project Himalaya about a suitable trekking peak to climb in the area. 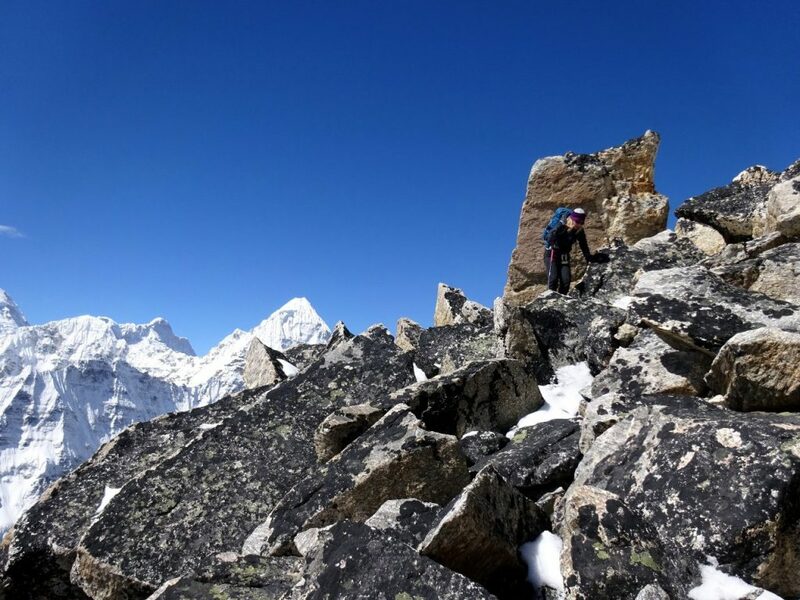 I knew that the only officially designated trekking peak in the Kangchenjunga region, Bokta (6,143m), hardly ever gets climbed because of a high rockfall risk. In true Nepalese tradition, nobody working in an official capacity in Nepal’s tourism industry cares about this. 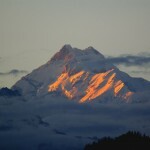 The list of 33 official trekking peaks has been around for 40 years now. You would be forgiven for thinking the peaks were selected by a blind man sticking a pin into a map of Nepal. The list is begging to be revised. 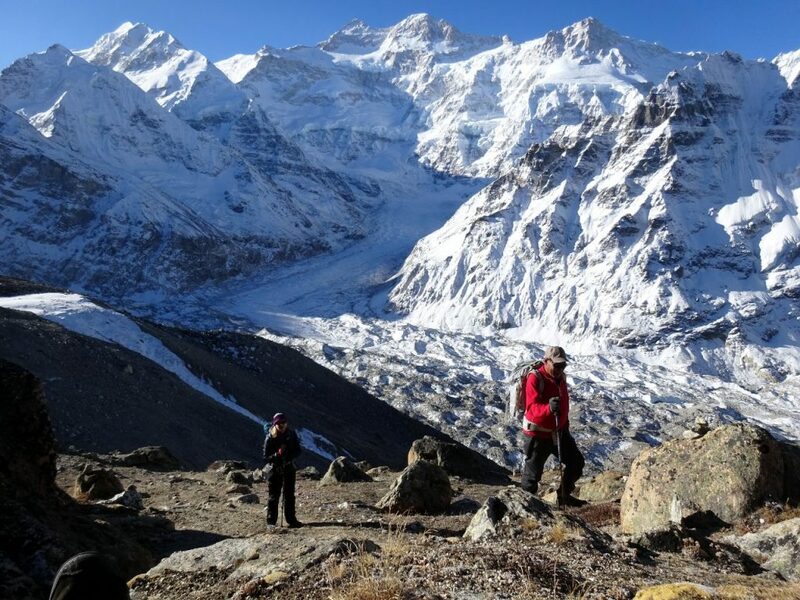 A list of more suitable trekking peaks would undoubtedly boost tourism to an area such as Kangchenjunga, by providing tour operators with a number of interesting new trekking options. One of these is Drohmo Peak (6,881m) and the other is Drohmo Ri (5,958m). Don’t confuse them. In the absence of official guidance, I spoke to Jamie, who is the perfect man to talk to about this sort of thing. Not only is he passionate about trekking, but he regularly explores smaller peaks to find any that are worth including in itineraries. Indeed, one of the pages on the Project Himalaya website is a good source of info. Jamie suggested that we climb a 6,000+m bump on the ridge of Drohmo, which he said was just a scramble. He said that we might even be able to do it without crampons if conditions were right, though he recommended an axe and crampons just in case. After an exchange of photos, a perusal of Google Earth, and some further research that revealed Jamie’s 6,000+m bump was sometimes given the slightly more appealing name of Drohmo Ri, we decided to give it a go when we were in the area. The peak rises directly above the teahouse at Pangpema, at 5,143m the last stop on the trail to Kangchenjunga’s north side, barely more than 5km from Nepal’s eastern border with India. Drohmo Ri is not to be confused with Drohmo Peak (6,881m), a much more serious knife edge of fluted ice rising just behind it. To give you an idea of just how serious Drohmo Peak is, its main summit has never been climbed, but its 6,855m central summit was climbed by Doug Scott and Roger Mear in 1998. The description world’s easiest in the title of this blog post will act like an invitation to some readers, but Doug Scott is not one of these people. Drohmo Ri, by contrast, is an innocuous grassy bump. If you’re standing below it, you might not even describe it as a peak. Don’t be deceived though. It rises more than 800m above the teahouse, and is therefore a good hike. It is isolated from the surrounding hillsides, and is therefore clearly a standalone mountain. There was only a slight dusting of snow when we went there. Although we’d brought our mountaineering boots, ice axes and crampons, we decided to leave all of these things down below, and climb in just our approach shoes (as well as the rest of our clothes, obviously). There was no need for a pre-dawn start (unless you’re one of those people who prefer to climb in the dark so that you can watch a sunrise while freezing your nuts off). We left at 6am and reached the summit at 9.30, while the sky was still clear. As Jamie had said, it was just a trek along a clear (if steep) trail over grass and scree slopes. The last 200m involved rock-hopping across a boulder field. This terrain will be rather more hazardous after fresh snowfall, with the added risk of putting a leg through a rock crevasse. Drohmo Ri even has a semi-satisfying summit ridge, where the odd use of the hand can be useful. The view from the summit is as good as any in Nepal. On the northern side the land drops away to a jagged glacier before rising up again to the wall of Drohmo Peak. It’s no surprise that this one has never been climbed, though it has a range of summits to choose from. Drohmo Peak (6,881m) from Drohmo Ri. The main summit is one of the ones on the left. Doug Scott climbed the higher of the two in the middle. To the south it’s all about the north face of Kangchenjunga. The view from Drohmo Ri is straight up the Kangchenjunga Glacier to the base of its 3,000m wall of black rock and hanging seracs. Only Kangchenjunga’s two highest summits, the triangular main summit (8,586m) and more rounded Yalung Kang (8,505m), are visible from this side. 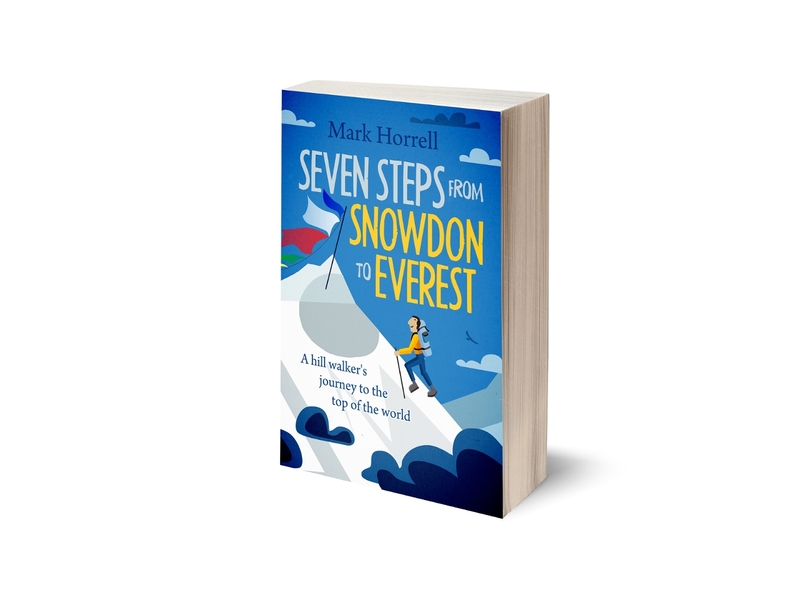 You can get a good sense of what Doug Scott went through on his other nearby climb, when he made the first ascent of Kangchenjunga from north side with Joe Tasker and Pete Boardman in 1979. 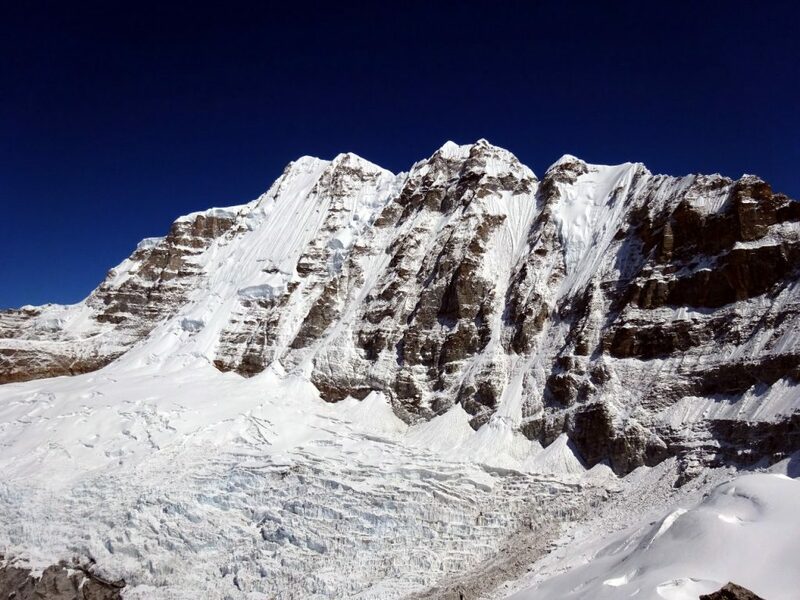 Scott and company avoided the north face by turning left at the end of the glacier and skirting underneath the western side of the north ridge to the col between the main summit and Yalung Kang. This avoids most of the suicidal hanging seracs, but there appears to be an awful lot of steep rock on this route. I won’t be trying it myself. The north face of Kangchenjunga has seen few ascents, but it’s nice to look at – another good reason for climbing Drohmo Ri. The north face of Kangchenjunga from the summit of Drohmo Ri. The main summit has the bird-shaped cloud above it. If you’re looking to bag an easy 6,000er though, you’re going to have to look for another peak. 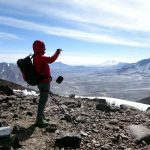 We took three GPS readings on the summit with different devices – Edita’s iPhone (which gave a reading of 5,952m), my Android phone (5,954m), and my Garmin (5,968m) – providing an average altitude of 5,958m. The easiest 6,000m peak I’ve climbed is still Chulu Far East. But Chulu Far East is a climb, not a trek. Similarly, Mera Peak is sometimes described as a walk up even though it involves climbing a 30m ice wall to reach the summit. On a day like we had, however, Drohmo Ri is definitely just a walk. We had a little more fun on the way down. Or I did. Steep scree and boulder fields are sometimes easier to ascend than descend, and that’s definitely the case on Drohmo Ri. I alarmed Edita by trying to do some scree running. Twice I ended up on my backside after triggering a couple of minor rock avalanches. This is not recommended. It was a bit of a two-hour slog to get down again, but at 3½ up and 2 hours down, I can say with some confidence that Drohmo Ri is probably the easiest 5,958m peak in the world. There’s even a teahouse at the bottom where you can get a hot meal. If you ever trek to Pangpema to see the north side of Kangchenjunga, then you should definitely allow an extra half day to climb Drohmo Ri, even if you’re just a trekker. The view is something special. 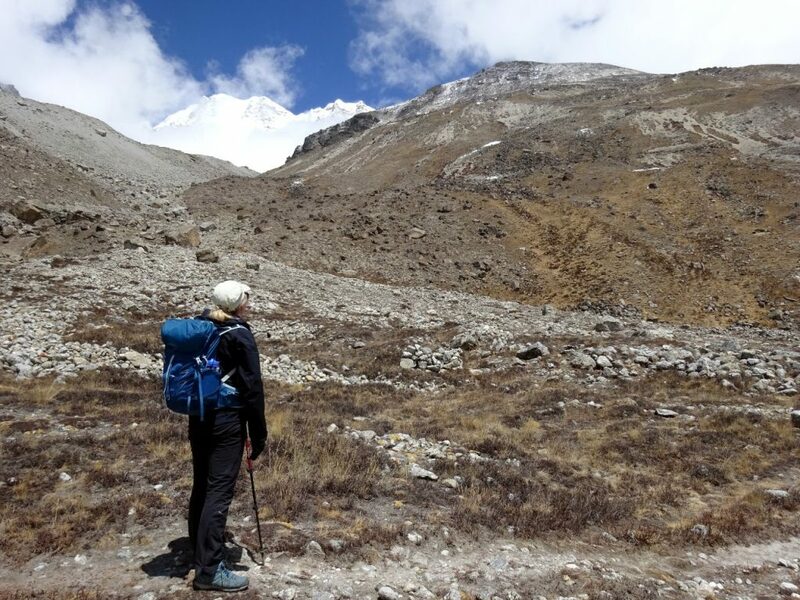 You can see all my photos from our Kangchenjunga trek here. My full trip report is coming soon. 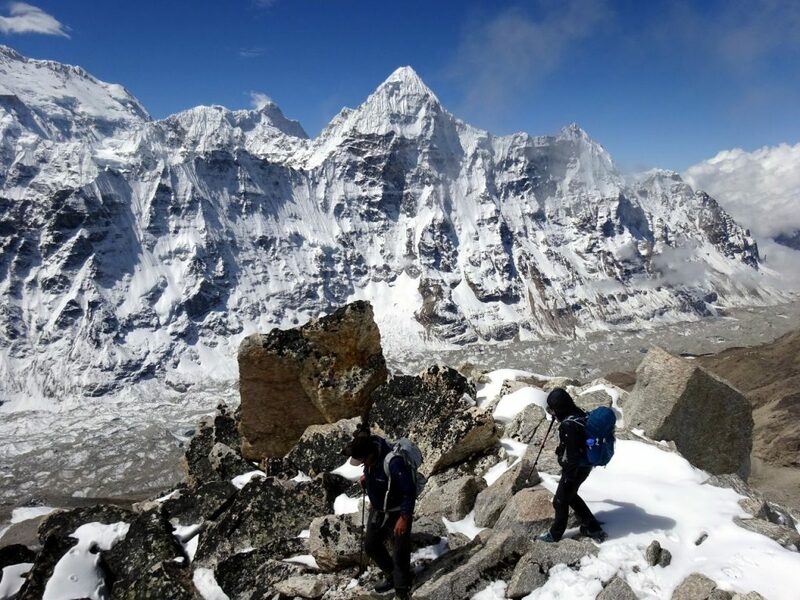 Who better than you to revise Nepal’s trekking peaks? Cometh the hour……..
You climbed Drohmo Ri EAST, but the 6000m+ scramble is Drohmo Ri West. 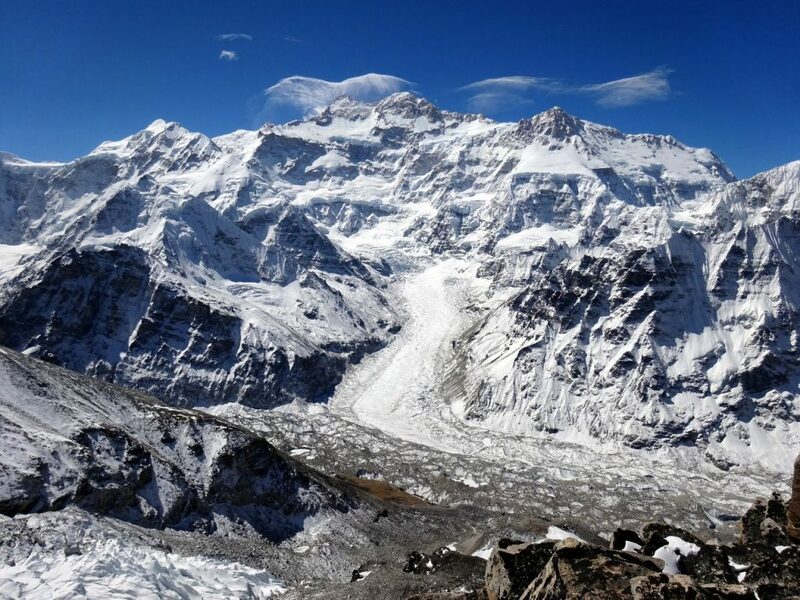 The view from the East peak up the glacier in front of Kanchenjunga is definitely better. Actually we studied both peaks to try and work out which one you meant. The western one, while slightly bigger, was girdled by a crappy scree slope at the bottom, appeared to have a short cliff halfway up, had more snow on top, and seemed to be more of a ridge sprouting from Drohmo Peak than a standalone peak. The eastern one certainly looked easier, and would clearly provide a better view of Kangchenjunga, so that’s why we chose it. But perhaps the western one really is the world’s easiest 6,000er! Thanks for the recommendation in any case. All of which reminds me it’s time to re-read The Ascent of Rum Doodle. Wow! This seems like quite an amazing climbing experience, Mark! Climbing up the Drohmo Ri sounds like fun and it definitely deserves a place on my bucket list. Plus, that view is worth the effort. When would it be the perfect time of the year to undertake this climb? 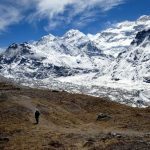 Generally the best times to trek in Nepal are pre-monsoon (April and May) when it’s warmer but cloudier, or post-monsoon (September to November), when it’s colder but usually a little clearer.